Choosing maternity clothes isn’t an easy task, especially in the spring and summer. During these seasons the weather is changing, and temperatures are on the rise. You will need maternity outfits that’ll keep you cool, comfortable and stylish looking. 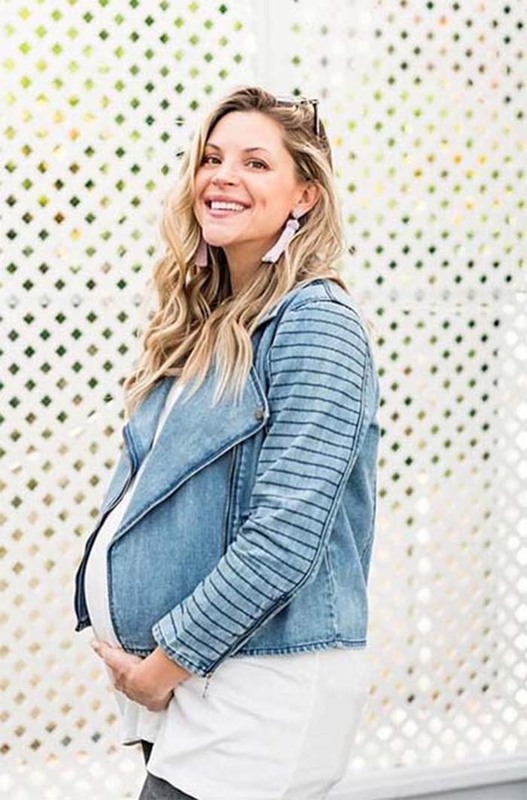 To give you some ideas, we have found 7 maternity outfits for spring and summer. There is an outfit to suit any occasion and any style. First up we have this beautiful dress and kimono combination. Both items are light and floaty which is great for the warmer weather as they will keep you cool. You could wear an outfit like this for many occasions from a day out to your baby shower. This outfit was created by Pink Blush and you can find many other similar pieces on their website. Nautical stripes always come back into the style spotlight during spring and summer. Stripes can create a super cute maternity outfit. This outfit features a stripe top, jeans, hat, sunglasses and a necklace. All these elements create one trendy outfit. You can wear any other shoes that are comfortable for you. Maybe white sneakers. Boho is another trend that comes back during the summer. The bohemian trend is easy to wear and will suit everyone. You could go for an outfit like this one, the key element is the long off the shoulder dress. It is light, floaty, stylish and will keep you cool. The rest is just accessories which you can choose yourself, just wear sunglasses, jewelry etc. that you like. Next, we have a cute pearl top and jeans. You could wear a pearl top like this with any jeans. Blue or white would be nice. If you can’t find a pearl top you could make one yourself. Find a top that you like and sew the pearls on yourself. It would be a fun project and you will have a unique top. If you want a fun spring/summer look then this next idea could be for you. This fashionista is wearing a cute leopard print dress. Dresses like this are easy to wear, will suit everyone and will keep you cool. You can wear with any shoes. Maybe try sneakers, flats or sandals. Even though the weather is getting sunnier, it still may be chilly on some days. For these days you will need a jacket. As it is spring, you don’t want a heavy, dark jacket so the perfect solution is a denim jacket. Denim will go with everything, it will keep you warm and suits the spring and summer vibe. If you have a special occasion coming up or if you want to dress up a little, then consider wearing a lace dress like this one. It is chic, classy and can be dressed up or down. As it is spring and summer, choose a light shade like this one. There are many lace dresses available so shop around and find the perfect one for you.